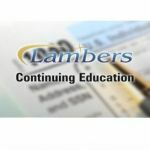 IRS Professional Responsibilities, Practice and Procedure – Lambers, Inc. This 2 credit hour on-demand video CE course discusses client refunds, due diligence in preparing returns penalties and compliance with e-File procedures. Course is instructed by Professor Arthur Reed, MBA, CPA, MST.